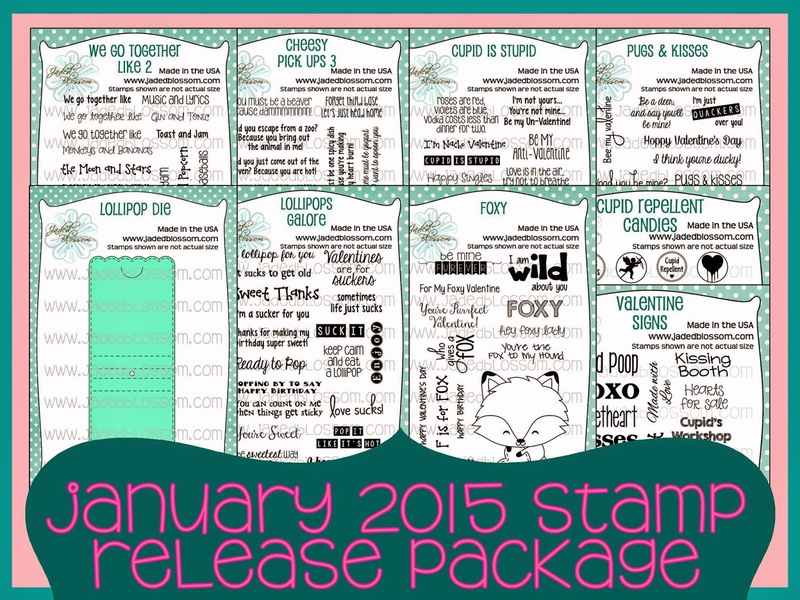 Welcome to Jaded Blossom's January 2015 Release Blog Hop. Now if you're here from Jaded Blossom you're in the right place, if you're just passing through start at the beginning because you don't wanna miss anything. I also have the complete line up at the bottom. Here is what I made!! 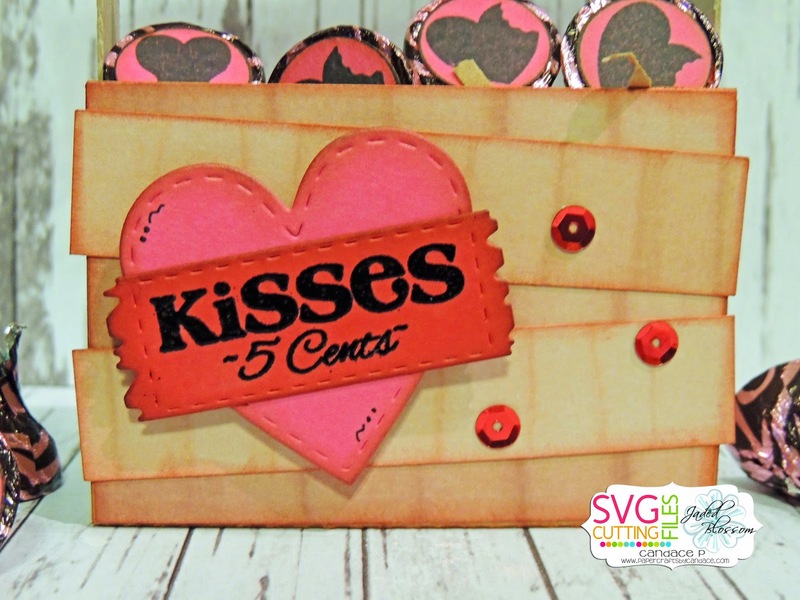 This ADORABLE kisses treat box is NEW from SVG Cutting Files! 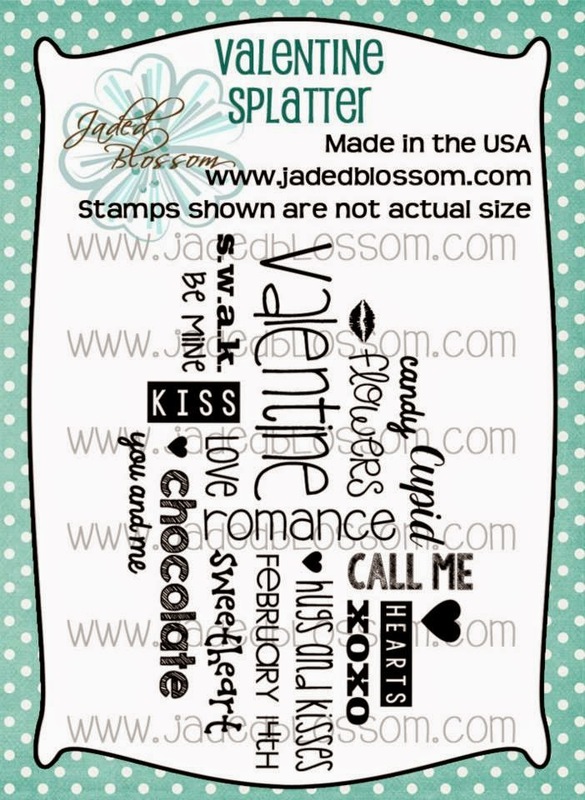 I used Jaded Blossom's Cupid Repellent Candies, Valentine Signs, Fall Dies and Valentine Dies. Here is a close up of the front of the treat box..
And here is my second project!! I used the lollipop die to create a gift card holder. I also used Jaded Blossom's goody bag die, candy charms & banner die and Wizard Candies. This Minnie cupcake can be yours FREE! All you have to do is head over to Pinterest and REPIN the photo FROM THIS LINK. 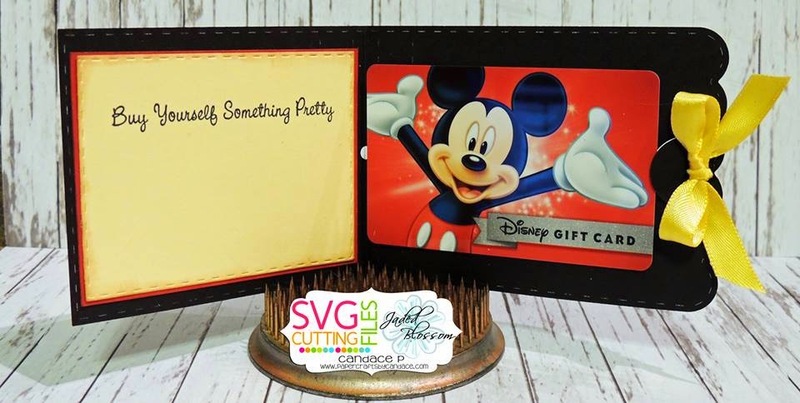 Once we hit 150 repins, this will be posted as a freebie in the SVG Cutting Files Galleria on Facebook. Here is a look inside.. I used Jaded Blossom's Gift Cards Galore for the sentiment. 1 - Free 2x3 Stamp for customers that spend $40 or more before Taxes and Shipping! FREEBIE is only available until Sunday 1/18, 11:59pm pst. 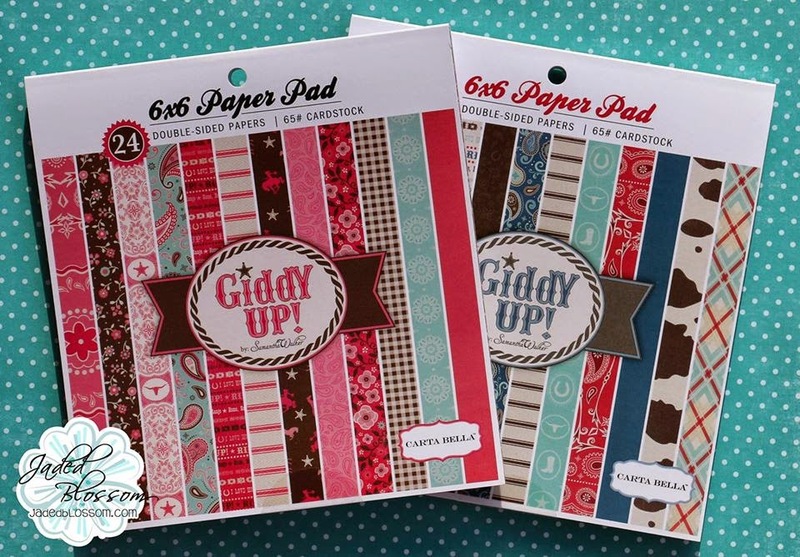 2 Lucky Winners will receive 1 of these 6x6 paper pads! Your projects are both so cute! Love the gift card holder - brilliant!! OMG these are both so so cute! LOVE IT!!! your projects are amazing!! Amazing projects. Love the gift card holder. Oh my your projects are just adorable!!!! so cute I love everything!! So adorable, I just melted ! OMG ~ I love this!!! Awesome job! Love your style of creating! Super cute and re-pinned, TFS!! loving all these cute ideas!!! 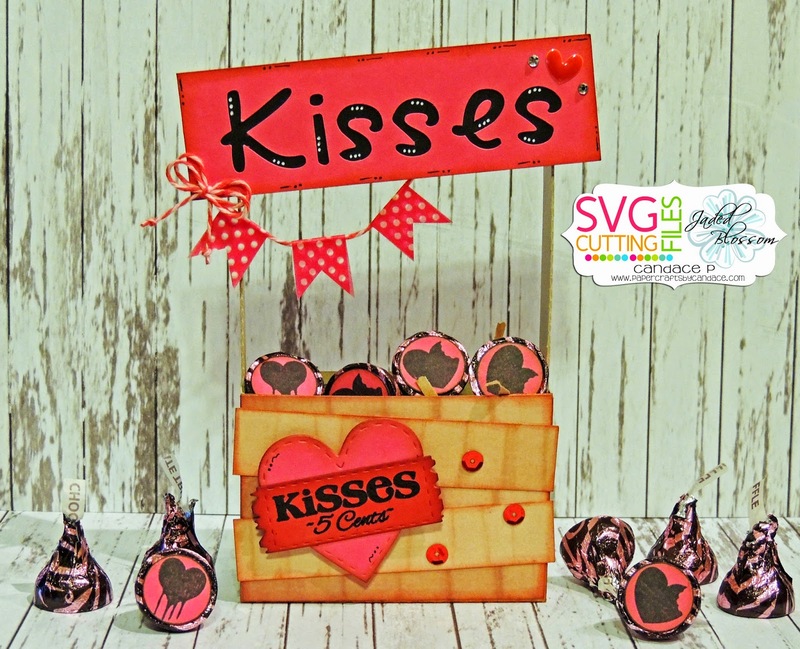 LOVE the kissing booth and your fabulous GC holder! Oh my Goodness. Both your projects are adorable. 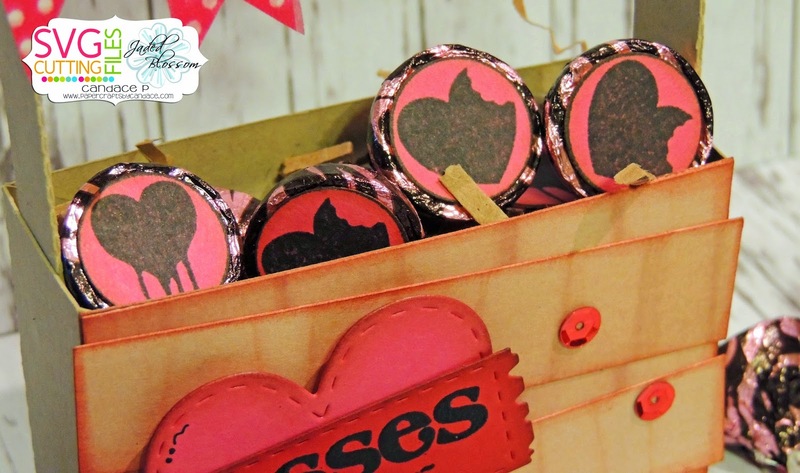 That little kissing booth is adorable Candace and I love that you used the lollipop die for a gift card holder!! Fabulous projects!! I love them both! I left my comment in the other post LOL. Anyway, love the treat box and the minnie cupcake card is beautiful! Great projects! Oh my! 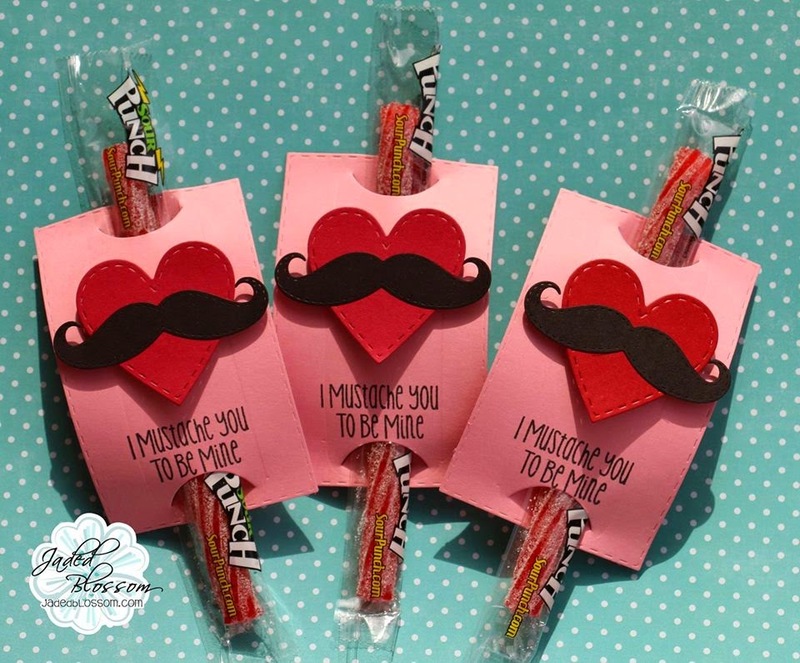 These projects are too cute! OMG! 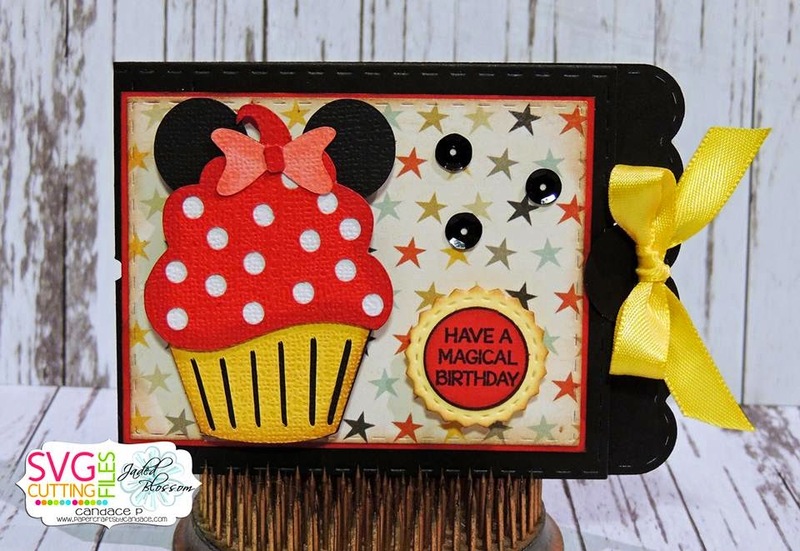 Sweet, sweet basket and I LOVE your minnie cupcake card! Love your projects. The use of the lollipop die as a gift card holder is very creative. Love, love, love. Both are great projects and it's hard to choose a favorite dog gone it. I love your projects. Super adorable. Love the mustaches they are all the rage! Super cute! Too cute!!! Love your projects. I hope that Minnie cupcake is released! So cute!!! Great idea for the lollipop holder. I wouldn't have thought that. Awesome job! I love what you did with the lollipop die. 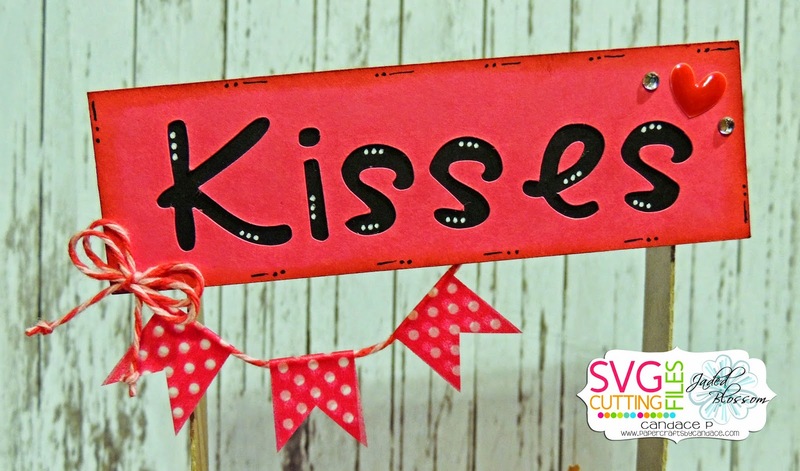 What an adorable kissing booth! Adorable treat box...love the gift card holder too!!! Oh my gosh, I love them both! The washi tape banner is adorable - never thought of that!!! And I love using the lollipop die for a gift card - you are just so darn clever. and the cupcake, well, it's fabulous. Your crate treat box is just adorable! The candy stamps are so cute. Both of your projects are fabulous as always!! Super fun projects!! I just love the new release~ thanks for a great week of inspiration! OMG!!! I just love the valentine box!!!! How stinkin cute! I live in Florida and am a HUGE Disney fan. Your projects are right up my alley!!! This is such a cute project. Love how you combined the Fall Die with this crate. What a cute project!!! Thank goodness I have that Fall bundle set as well. so cute! love it and thank you! LOVE the kissing booth idea! Such a fun project, Candace! I love these projects. Very cute. Both are Adorable!! Adore the treat box and yummy cherry cupcake trendy twine. such cute projects - just love the creativity!! The gift card turned out great! Love it! Love the washi tape banner! I love both of your projects! I repined the Minnie Cupcake card. oh so cute! I can only imagine Lucy and Charlie Brown behind the kissing booth! Your treat is so cute! But that Minnie Cupcake....OMGeeee!!! As a fellow addict...I just LOVE LOVE LOVE her!!! Love Love Love the candy box! Great job! This is perfect for my teenage son!Like how you used many pieces to bring it together. Too cute! Love all the ways to share the sweetness! Your Valentine stand is a perfect candy dish and that Minnie cupcake is scrumptious! Love this. Love the banner idea especially. AWw, I love these both! So cute! Love both of your projects, I have a friend that just came back from Disney and she would love your giftcard holder. Love the projects. Thanks for the inspiration. This treat box is sooo cute! Love it! Bee My Valentine: Featured on the Twinery Blog!